"Silver bullets" and "silver scapegoats" drive much of the debate over what's wrong with America's schools and both forms of "silver" are false gods, all wrong and generally irrelevant, writes Wendy Kopp (with Steven Farr) in "A Chance to Make History: What Works and What Doesn't in Providing an Excellent Education for All" (PublicAffairs, 304 pages, $25.99). Kopp is the founder and chief executive of Teach For America, an organization modeled on the Peace Corps that was founded in 1990 and has more than 25,000 alumni across the nation. TFA alumni are drawn largely from elite colleges and universities -- although not exclusively from the historic ones like Harvard, Yale and Princeton, the author points out -- and many of them decided to become educators after their two-year period of service was completed, rather than going into much higher paid professions. Kopp gives us several examples, including Michelle Rhee, until recently chancellor of the District of Columbia public schools, who resigned after more than three years on the job after the man who appointed her, Mayor Adrian Fenty, was defeated in last fall's primary election. Through anecdotes describing how TFA alumni and others have work to transform education, Kopp demonstrates what it will take to deliver transformational education to underserved urban and rural students, education that changes the academic and life trajectories predicted by the socioeconomic backgrounds of the students. Sharing her experiences in some of the country's most underserved communities, ranging from the Rio Grande Valley of Texas to the devastated schools of New Orleans (devastated long before Hurricane Katrina in 2005), Kopp introduces us to teachers at the classroom, school and system levels who've set out to accomplish what many think is impossible. I have to admit that I've been guilty of believing in one of Kopp's "silver scapegoats" -- blaming lack of interest by parents for their children's under performing at school. I've tended to believe that certain ethnic groups, including West Indian blacks like the parents of Gen. Colin Powell, as well as Amy Chua's Asian "tiger mothers" and stereotypical Jewish mothers who used guilt as a weapon to shame their children into achieving, are responsible for achievement in these communities. Kopp believes one of the problems is not with uncaring parents, but whole communities that set the bar too low, that don't expect people like Juan Orozco, whom co-author Steven Farr taught as a 1993 Teach for America corps member in the Rio Grande Valley, to end up with a fellowship to Oxford University in England. Growing up in a valley colonia, Juan was bright and intelligent and appeared to have potential, but he was distracted by the need to work in the fields much of the time. Farr and another TFA corps member researched programs that would help motivate Juan and helped raise money to pay for Juan's expenses to England and even drove the young man to Houston to save on air fare to England. Today, "motivated by his experience" at Oxford and later in college, Juan Orozco works at the Sargent Shriver National Center on Poverty Law in Chicago. It's fitting that a poor Latino from one of the poorest parts of the country works at a place named after Shriver, the driving force and first director of the Peace Corps, who died at the age of 95 on Jan. 18, 2011. Stories like this show that "silver bullets" like more money, more technology, charter schools, laptops for all, multimillion educational facilities like one in Philadelphia that Kopp mentions and the new palace of education that the Los Angeles Unified School District has built on the site of the Ambassador Hotel on Wilshire Boulevard in Los Angeles are not the answer to solving what's wrong with American education. There may be a "silver bullet" after, Kopp suggests: "The leaders who are changing whole school systems show great discipline in communicating a clear, unifying, inspiring, and ambitious vision of a system that enable children to fulfill their potential; implementing systems of management, support, and accountability that ensure alignment and effectiveness for every member of the team, and making the recruitment and development of great people a primary high-investment part of the system." In other words, to use the phrase of a business motivational writer Kopp cites, "people aren't the most important thing; the RIGHT PEOPLE are." Perhaps the elitism inherent in TFA, often cited by critics of the program, is really a good thing after all. It flies against the anti-intellectual spirit that has often been named as one of the problems facing Americans, but the right kind of elitsm, one that says that most students possess the potential for greatness, is what helped Steven Farr and one of his fellow TFA corps members, Stephen Ready, recognize the potential of Juan Orozco that enabled him to achieve something far beyond the expectations of others. One way Kopp has to answer critics of Teach for America, who say, among other charges, that's it's a source of lower paid teachers displacing established, union-member teachers, is to tell the story of her eight-year old son Benjamin "wondering why in the world would we encourage inexperience college graduates to take on a problem as difficult as educational equity." Kopp goes on to explain that Benjamin was writing a paper for school and decided to interview his well-known mom. "I think the story underscores just how counterintuitive this effort seems at first blush. What we have learned is that highly effective teachers in low-income communities change kids' lives -- and kids change theirs. We are, with significant investments in recruitment, selection, training and support, developing strong teachers who are closing the achievement gap in their classrooms." 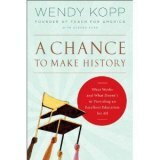 When I picked up "A Chance to Make History," I expected to read a glowing history of Teach For America. While Kopp is justly proud of the organization she founded two decades ago, her book goes beyond TFA to explore realistic solutions to the chronic problem of underperforming schools that turn out underperforming students. This exploration makes it a valuable addition to the vast amount of literature on educational reform. "A Chance to Make History" cuts through the noise of today's debates to describe precisely what it will take to provide transformational education---- education that changes the academic and life trajectories predicted by children's socioeconomic backgrounds. Wendy Kopp is the founder and president of Teach For America and the author of "One Day, All Children." Steven Farr, Teach for America's vice president for knowledge development and public engagement, is also the author of "Teaching as Leadership."